Don’t you just love when a complete blunder turns into something incredible?! I had this fantastic idea to make a pumpkin pie spiced pumpkin seed brittle. Sounds great, right? Just a few minutes into making the brittle, I realized that my measurements were all off – there just wasn’t enough thick caramel-like syrup to form into a classic brittle. I muttered a few choice curse words, scraped the contents of the pan out onto a Silpat, and just left it – thinking that I would have to scrap it once it cooled. Except when I tasted it, it was good! Really good! Like I can’t stop eating it, kind of good! Just for the sake of my original idea, I went back to square one and tried to make an actual brittle. With a little tweaking of the recipe, it worked. I made a gorgeous brittle. But after a sampling, I actually much preferred the taste and texture of the clusters I had accidentally made. Talk about a happy accident! I’ve been making this all weekend, it’s great to snack on, to take with you on a hike, or even tame that midday sweets craving. With the holidays coming up, it also makes a perfect snack for your guests! 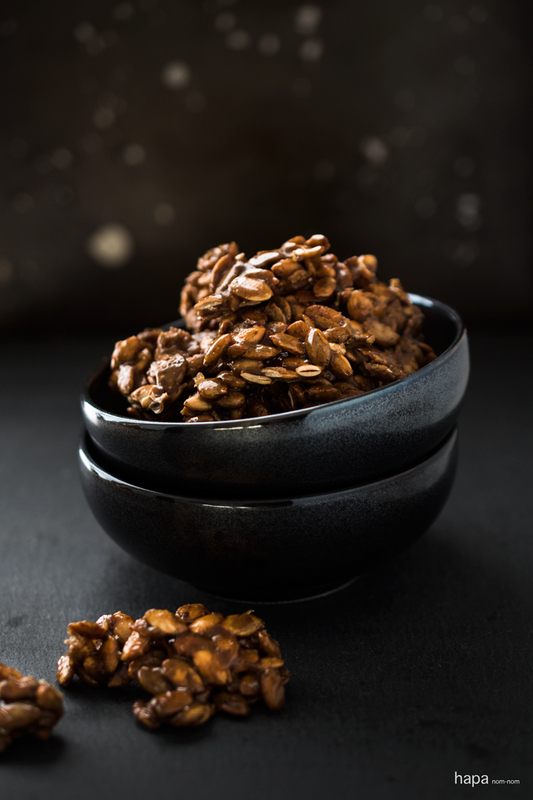 Candied Pumpkin Seed Clusters with pumpkin pie spices - great to snack on and totally delicious! Line a sheet pan with parchment paper or a Silpat. Then prep all of the spices measuring and combining the cinnamon, nutmeg, ginger, allspice, and cloves in a small bowl. Add the pumpkin seeds, sugar, honey, and water to a large heavy-bottomed sauce pan. Place over medium-high heat and stir constantly until the mixture becomes syrupy and a caramel color, about 6-8 minutes. Remove from heat and add the butter. Stir until melted and then add the vanilla. While stirring constantly, add the spices, and stir until fully incorporated. Transfer the candied pumpkin seeds to the prepared sheet pan and spread out in a thin layer. Allow to cool, break apart into clusters, and enjoy! *The pumpkin seeds I used are raw, green, and hulled (outer casing removed). These can be purchased at any whole food or health store. 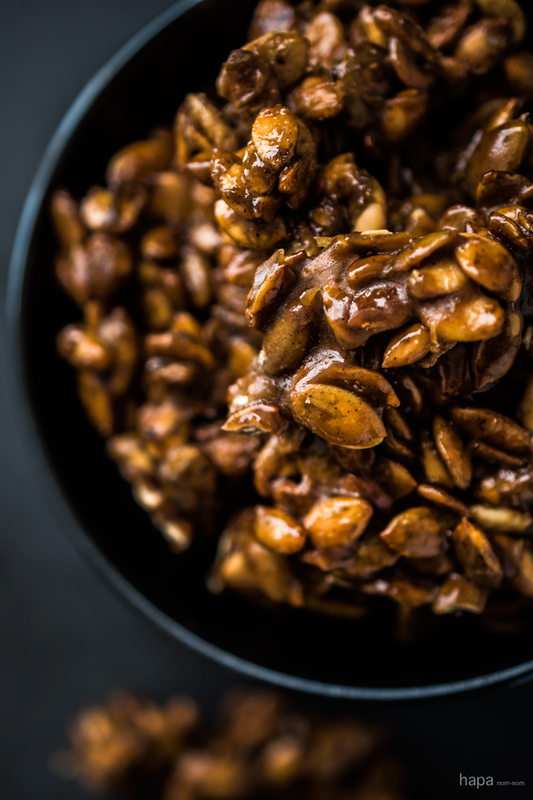 I have not tried this recipe with seeds straight out of the pumpkin (still in its hull), but I do have a great recipe for Roasted Pumpkin Seeds, that uses those seeds freshly scooped from a pumpkin - they're also great to snack on! i am supposed to be pinning for holiday eats and keeping others’ taste buds in mind, but i keep wandering off the path for my own tummy. taking these bites of love on a hike = great idea! they look beyond yummy. I made these last night to go on top of some pumpkin pots de creme I served at my supper club. Perfect recipe! That’s great, Kristen! I’m so glad you enjoyed them! And those pumpkin pots de creme sound incredible! These pumpkin seed clusters are wonderfully unique. Aromatic, sweet, sticky, and crunchy—they must be so addictive! Awesome snacks! Anyone who is craving a pumpkin for Halloween should use their seeds to make these clusters! Sweet and crunchy little bites are perfect for the holidays. Ooo…. I didn’t know pumpkin seeds have to be hulled first. Good to know. Thanks girl. You know what? I didn’t think about it prior to my mistake, but I prefer the clusters to slabs of brittle too! Yay to happy accidents! Love that these turned into clusters and I’ll definitely try them! What a fun happy accident! Every mistake should end up so well… right?! This is why I follow you. While everyone else is doing pumpkin desserts, muffins, dips, you knock it out of the park with something so unique but totally doable AND thrifty. Never will I throw out pumpkin seeds again. So glad you stuffed up and “discovered” this. You rock! Sharing! Mmmm… I love it when these types of blunders happen, Kathleen! No doubt kitchen fails can be frustrating.. but then, there’s the beauty of when this happens! Delicious mistake my dear and I love the suggestion of taking them on a hike! Can’t wait to give these a go! Thanks, Traci 🙂 I’m always looking for little snacks to take on hikes or bike rides, so this happy accident definitely did double duty. Oh my, I feel like I could pluck a cluster right off the page! Your pictures are stunning. Don’t you just love happy accidents? This looks like a treat I could get used to! Talk about a very happy accident! Every year we look for different things to do with our pumpkin seeds .. love love love these clusters!! Brilliant! Lol! Love all the ‘eeeee’s’ 😉 You can’t have fall without pumpkin seeds, right?! I love it, that’s how great recipes come about, by accident! Beautiful photography as well, it’s not easy to photograph random clusters and you did it very well. Kathleen, these clusters look so yummy! I wish my kitchen accidents turned out like that! lol I actually just picked up some pumpkin spiced pumpkin seeds from TJ’s for a salad I wanted to share on the blog. I’m already addicted to them so I can just imagine me downing these clusters like it’s no one’s business LOL! These are genius and I can’t wait to make them! Ooo… I can’t wait to see your salad – I just know it’s going to be stunning! Kathleen, I love that you were able to save this into these gorgeous clusters! I don’t eat pumpkin seeds nearly as much as I should–they are so tasty, and I bet they’re even tastier transformed into these!